NOW Food Whole Psyllium Husks are true dietary fibers, even though it is classified by some as a laxative or mucilaginous fiber, and is a convenient way to increase intake of dietary fiber because of its high mucilage content. This bulking agent swells considerably when added to liquid, which can help to support healthy gastrointestinal transit time. This bulking action and healthy transit time can play an important role in maintaining healthy gastrointestinal function. Gentle relief of occasional constipation. Promotes bowel movement by increasing bulk volume and water content. Dosages: Children 6 - 12 years: Take 2 teaspoons, 3 times daily. 12 years old to Adults: Take 4 teaspoons, 3 times daily. Mix each dose into 250 mL (1 cup) of liquid, stir briskly and drink immediately. Produces bowel movement in 12 to 72 hours (3 days). Caution: Consult a health care practitioner if symptoms worsen or if laxative effect does not occur within seven days. Consult a health care practitioner immediately if you experience chest pain, vomiting, or difficulty in swallowing or breathing after taking this product. Consult a health care practitioner prior to use if you are taking medications which inhibit peristaltic movement (e.g. opioids, loperamide) and/or if you have symptoms such as abdominal pain, nausea, vomiting or fever (as these could be signs of abnormal constrictions of the gastrointestinal tract, diseases of the oesophagus and/or the superior opening of the stomach (cardia), potential or existing intestinal blockage, paralysis of the intestine, megacolon, faecal impaction, inflamed bowel or appendicitis). Do not use if you are experiencing a sudden change in bowel habits that has persisted for more than 2 weeks, undiagnosed rectal bleeding, failure to defaecate following the use of another laxative product, if you have diabetes mellitus in which blood sugar is difficult to regulate and/or difficulty swallowing. Hypersensitivity, such as allergy, has been known to occur following inhaled and/or ingested psyllium; in which case, discontinue use. May cause temporary gas and/or bloating. Great product! It eliminated my IBS symptoms. I find the best take it is on my food. Very good psyllium. One of my two favorites. I use this product every day in water. Great product for digestive track routine. Love this product! I use it to make non-toxic borax free slime for my daughter to play with. 1 tbsp psyllium with 1 cup water in a pot, stir and heat up, add dye and glitter! Great for low carb bread. 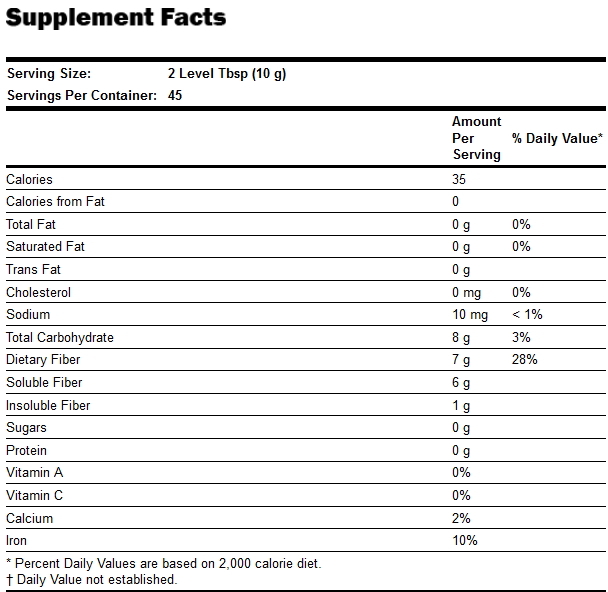 It's all natural and isn't difficult to include in a daily health routine. I like it. This is an excellent product. My husband and I take it each morning and we both find it keeps our digestive system running smoothly. We wouldn't be without it and even take it with us when we travel . Good product. Take a portion each day and it works well. Best than Metamucil because no sugar, no colorant. Best psyllium and when it's in sale, very good price! It help very muchn my husband for his cholesterol and blood sugar level. Super easy way to get more fiber in my diet. In smoothies, soups, porridge, ceral, anything. Love the stuff. This is a great product. When I'm down in the States it is easy to find bulk psyllium husk - even Walmart carries it. 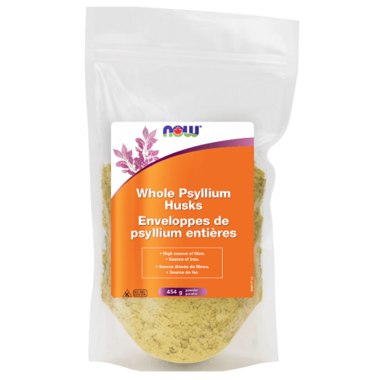 But it is not easy to find husk psyllium (as opposed to powder) in Canada, and for such an affordable price. Plus it does the body wonders, especially if you have somewhat sedentary employment. The SAD diet is deficient in fiber and this is a great way to increase it. Plus I hate those sugared orange and red powdered varieties. I use Now Whole Psyllium Husks every evening with dinner. It is a great product.... excellent price, and I actually like the neutral taste (can't stand the orange and berry flavours some of the other brands have come up with). Also, it really works! Great way to include more fibre in one's diet. This stuff works and is all natural. I`m glad that it was available saved me the time and hassle to find a store that sells it. This is a great product - I use it in smoothies and also in baking in place of oat bran, or as an added extra to muffins, loafs, bread, etc. My husband uses this and just loves it. It is a great form form of fibre, doesn't taste bad and uses it every day. No more Metamucil for him, strictly Psyllium fibre! A marvelous product! Highly recommended! Works very well for bowel movement. Best source of fiber! Definetly works. I put it in my tea daily. Will buy again! Good product good value, great taste, its even great to use in milk shakes, I would buy it again. This product was good value for the money and high quality. I have no complaints. My wife and I take Psyllium daily and our digestion is so much better. Thank you.